If you want to learn a foreign language, you will get in touch with a lot of language learning myths. But the big question is: Which ones are really true? Myth 1: It is OK to make mistakes. Of course, you will make mistakes, but they aren’t ok. The truth is: They are necessary and important for your learning progress. Only if you make mistakes and if you correct them, you could learn a foreign language. Nobody is perfect and mistakes could help you to be careful with new words and grammar explications. Myth 2: You have to go to a foreign country to learn a foreign language. Yes and no. You could learn a foreign language at home, in a language school in your hometown or in the car, in the bus or in the train. You haven’t to visit another country to learn a foreign language. But you will find that it is much easier to learn a foreign language with a personal relation to the country where the language is spoken. The best you could do is a mix of both: Learn the language at home and attend a language school once or twice a year. There, you will meet people from all over the world who have the same goals and know what it means to learn a language. Just try the mix! Myth 3: You will always have a foreign accent. First of all: A foreign accent is not the worst thing. It is normal that you have an accent when you start to learn a new language. But after a few months or years, you will loose the accent and can talk like a native – maybe, if you want. In addition it is normal that you have a stronger accent in the one language and a lighter accent in another language. Just try to speak as often as you can to loose your foreign accent in your learning language! Myth 4: You have to start as a child to get fluently in your learning language. Maybe it is easier for children to learn a foreign language, but that doesn’t mean that there is an age limit. You could always start with a new language and it always depends on your motivation, your discipline and your personal goals. If you aren’t sure how to learn a foreign language, attend a language school to get a structure and a plan! 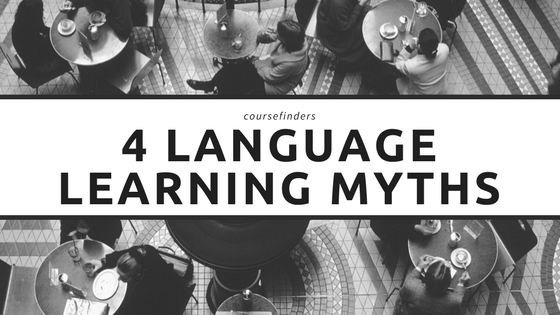 There are a lot of other language learning myths, but they won’t be important if you really want to learn a foreign language. Check our language schools and start to learn your new language!